Another Avatar moment at Standing Rock. This is a Golden Eagle that landed for about an hour. Natives gathered around it and were able to touch it. 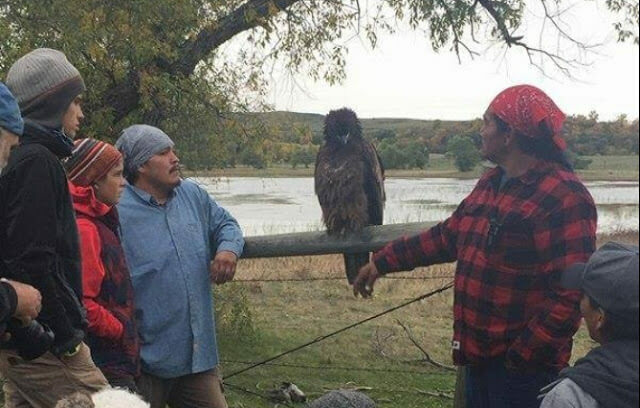 American Natives see the eagle as a sacred messenger that carries prayers to the Creator and returns with gifts and visions. Freedom is vital to the survival of the eagle and this teaches us that all people must be free to choose their own paths; to worship as the Creator leads them; and to respect the freedom of others. The Eagle teaches how to master the art of patience and how to move through life without material attachments from their ability to sit for long hours perched on a limb in meditation. Eagles have excellent hearing and can hunt as much by ear as by sight. To those to whom eagle comes, the ability to hear spiritually and psychically will awaken. Eagles have sharp beaks and strong jaws that can remove a finger in one snap. The eagle tells us to mind our words and how they affects others; to speak kindly without sharp rancor. Eagles are renowned for their superior vision, ten times greater than human eyesight. This quality is a gift of vision and clarity that should be used to help others through dark and troubling times. The eagle is a creature of the air, but has strong legs to walk on the earth and often lives near the water for food. These qualities of the eagle teach us to maintain balance in all dimensions to achieve inner-growth. As we soar to spiritual awareness, we remain well grounded in reality as we purify ourselves with the cleansing waters. The eagle teaches us to have the courage to strive for greater heights of spirituality. The Eagle is seen by American Indians as a connection to the Great Mystery – The Creator of all things. Man Tells His Bird It's Time To Go In The Cage. The Bird's Response? Hilarious!